The life of Jack London, the extraordinarily popular turn-of-the-century American author, was every bit as fascinating as those of the fictional characters depicted in his stories. He was a man of action as well as of thought. But lack London was much more than an author and adventurer. Born into poverty, he was molded into an ardent socialist at an early age. Possessing an instinctive craving for truth, he cast off the shackles of the religion in which he was raised and turned instead to the teachings of Friedrich Nietzsche and the logic of science. Endowed with both common sense and intelligence, he recognized the potential of eugenics and fervently supported its practice. With a deep reverence for his North European ancestry, he expressed an unquenchable faith in the superiority and the destiny of his race, and he produced some of the most extreme and most beautiful racial statements ever written. 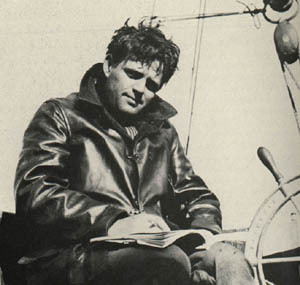 No honest attempt at the characterization of Jack London can be made without invoking the subjects of race, heredity, and Nietzschean philosophy; for these are the elements that comprised the very soul of the man and which fed the spiritual reservoir from which flowed both his deeds and the torrent of thoughts that fill the pages of his writings. It was his beliefs on these subjects that shaped his unconventional socialist world view and fueled his rampant political activism. He was a true champion of the Aryan spirit. His story should stir the emotional depths of every healthy Aryan soul. London, the author of 50 books over a 17-year period ending with his death in 1916, was the most successful writer of his day. And he has remained the most radical figure in American literature. He stood in sharp contrast to most of his contemporary American writers, who had been educated, but had never really lived, and who consequently produced soft, illusionary portrayals of life. American literature previously had depicted only the more pleasant side of existence, but London expounded on the life that he himself had experienced—a life, on the one hand, of grinding poverty and long hours of work for little reward in the new Industrial Age, and on the other hand, of adventure in the rugged Far North and the savage South Pacific. He was a self-made man who pulled himself up from the bottom of the socio-economic ladder. Most of his knowledge was self-acquired; he lacked an extensive formal education. He delved into the Greek philosophers and European history, and he acquired a familiarity with the works of the modern European philosophers, including Kant, Hegel, and Leibniz. He also became well-read in biology, anthropology, and sociology. His thought, however, was most strongly influenced by the most radical figures of the late-19th-century era into which he was born: Karl Marx, Charles Darwin, Herbert Spencer, and Friedrich Nietzsche. Marx was a primary political influence on London. Their views certainly did not always coincide, but Marx was welcomed by London (and many others at the time) as the only real political and social alternative to the status quo. In childhood London came to know firsthand the hardships of the working class under an unscrupulous capitalist socio-economic order. What he experienced in his early life determined his conversion to socialism and his participation in the revolutionary socialist movement. In conjunction with his hatred of capitalism, however, were feelings which clearly distinguished him from most of the Marxists of his day; despite the company that he kept, Jack London was never a real Marxist. In fact, his entire outlook on life ran opposite to the course of Marxist doctrine, with his very pronounced racial views in particular serving as a continual source of embarrassment for the international socialist movement, in which he became a prominent figure. His writing—a blend of individualism, racialism, and socialism—reflects both his adventurous, independent spirit and his genuine concern for bringing about a better social order. London was a staunch evolutionist and was well acquainted with the works of Charles Darwin. The Origin of Species was his favorite reading during his adventure in the Yukon. He also was drawn to the work of Herbert Spencer, whose social application of the doctrine of the survival of the fittest became a philosophical component of most of London’s stories. But I liked . . . all [Nietzsche’s writingsl—ate them up, and after digging through “Genealogy of Morals,” “The Case of Wagner,” “The Antichrist,” and others, I polished off with “Zarathustra,” which just happened to fill a need and accomplished more than any tonic to clear my surcharged mental atmosphere and set my feet on the road to recovery. Nietzsche’s teachings held a tremendous appeal for London, although the two men differed on some points. London shared Nietzsche’s dim view of contemporary society and conventional morality. Nietzsche’s individualism, however, was difficult for London to reconcile with his socialist beliefs, which held that individualism was counterproductive to the welfare of the community. London himself, however, was very much an individualist, and he had difficulty in harmonizing his own nature with his professed political beliefs. “I look only to the strong man, the man on horseback, to save the state from its own rotten futility. . . .
London and Nietzsche shared anti-religious sentiments. London’s own revolt against religion stemmed from his mother’s spiritualism and the recollection of having to serve as a medium at her séances when he was a child, and from his stepfather’s position as a Methodist deacon. He identified himself as an atheist and saw religion as being full of empty ritual and superstition.
. . . That we have groped for the way of right conduct and agonized over the soul betokens our spiritual endowment. Though we have strayed often and far from righteousness, the voices of the seers have always been raised, and we have harked back to the bidding of conscience. . . . No matter how dark in error and deed, ours has been a history of spiritual struggle and endeavor. We are preeminently a religious race, which is another way of saying that we are a right-seeking race. . . .
No great race adventure can go far nor endure long which has no deeper foundation than material success, no higher prompting than conquest for conquest’s sake and mere race glorification. To go far and to endure, it must have behind it an ethical impulse, a sincerely conceived righteousness. Jack London was born in San Francisco in 1876 as an illegitimate child and reared in poverty by his mother and John London, the man she married a few months after Jack was born. When he graduated from grade school his parents decided that instead of attending high school he would have to find work to supplement the family’s inadequate income. He was thrust into the world of the workingman under the rule of its miserly capitalist overlords while he was yet a boy of 13. He became employed by a cannery, ordinarily working 12 hours a day, but often as much as 18 hours out of 24. Once he worked for 36 hours straight for his ten-cents-an-hour wage. Jack was brought to the realization that something was very wrong with society and the world. It was a world that forced six- and seven-year-old children to work in coal mines and canneries for their mere survival, while the shrewd capitalists indulged themselves in the comfort and ease of their undeserved prosperity. His stark childhood experiences with capitalism implanted the seed of socialist rebellion which later matured into an active political struggle to topple the capitalist oligarchy. At the age of 15 he abandoned “honest work” in favor of the adventure and potentially greater reward of thievery. Working with a group of outlaws stealing from the oyster beds at night, he acquired the title “Prince of the Oyster Pirates.” Later, recognizing the futility of his pirating, he turned to the other side and joined the State Fish Patrol. During the winter of 1892, when Jack was not yet 17, he encountered a seal hunter, and that led to a seal-hunting stint in the North Pacific with a crew of sea-toughened Scandinavians. When he returned from the North Pacific venture, in the summer of 1893, his mother urged him to enter a contest being promoted by the San Francisco Morning Call. The newspaper was offering a 25-dollar prize for the best descriptive article. Jack wrote about the typhoon his ship had endured off the Japanese coast. On November 12, 1893, the Call published Jack’s article as the winner. A 17-year-old with only a grade-school education had triumphed over students from the University of California and Stanford University. This marked the beginning of London’s career as a writer. After his sea voyage, Jack went to work in a jute mill, at ten cents an hour for a ten-hour day. He left the mill when his employers refused to keep their promise to raise his wages to $1.25 a day. He next found work at a power plant, hoping to learn the electrician’s trade. However, he had to start at the bottom, shoveling coal for the boilers. The work exhausted him. His wrists became so swollen that he had to wear leather straps to support them. Later he discovered that he was doing the work of two men, as a scab. When Jack had come along, young and healthy, the superintendent had fired the two coal passers and assigned the duties of both to Jack. Shortly afterward, he learned that one of the men he had unknowingly displaced had committed suicide in despair over being unable to support his wife and three children. Jack retired his shovel, disgusted with his employers and the capitalist system in general. In Oakland another self-appointed “General,” Charles T. Kelley, arose, organizing one of the detachments for the Washington march. Jack and a friend set out on their own in the spring of 1894, hopping freight cars in an effort to catch up with Kelley and his followers. His friend turned back along the way, but Jack continued. Soon after he caught up with the marchers, however, the effort fell apart, with most of the men losing their enthusiasm for a cross-country trek. Eventually Jack left also. Kelley and a few loyal followers made it to Washington, but Coxey himself was in jail for walking on the grass of the Capitol grounds. Having left the “Industrial Army,” Jack then spent the remainder of the year traveling across the United States and Canada as a hobo. The experiences of his “tramp trip” provided the basis of many stories and essays he would later write. He was arrested for vagrancy one night after watching the Niagara Falls by moonlight and was given 30 days of hard labor at the Erie County Penitentiary. He was clad in prison stripes, his head was shaved, and he was forced to march in lockstep from cell to work detail. His diet consisted of bread and water, with meat being served once a week. Still socialism is an all-embracing term. Communists, nationalists, collectivists, Utopians, and Altrurians are all socialists; but it cannot be said that socialism is any of these, for it is all. Any man is a socialist who strives for a better form of government than the one he is living under. In April 1896 he joined the Socialist Labor Party. Instead of completing high school, Jack dropped out at the end of his first year and spent the summer cramming for the entrance examination for the University of California. He passed the examination easily and entered the university that fall. He had to withdraw at the end of his first semester, however, largely because of a lack of funds. By that time he also had come to question the value of a formal education. London re-entered the labor market, until he caught wind of the discovery of gold in the Yukon Territory in Canada. He joined the Klondike gold rush in 1897 and spent the winter in the Yukon. He returned from Alaska by a 2,000 mile boat trip down the Yukon River in 1898. He had found no gold, but he had kept a notebook recording his impressions of the sights and sounds of the region which later would provide the background for many of his stories. During the early months of 1900 he came to know Bess Maddern, a dark-haired woman of Cornish descent. She was an intelligent woman, who later would teach herself trigonometry and calculus and coach University of California students having difficulty with those subjects. Jack felt that she would be an excellent mate for the bearing of his children. At that time he wrote that, “biologically, love is an institution necessary for the perpetuation of the species.” They agreed to marry on the basis of “affectionate companionship,” hoping that love might come later. Jack eagerly announced that the marriage would produce “seven sturdy Saxon sons and seven beautiful daughters.” In actuality, the marriage ended five years later in divorce, with Bess having borne him two daughters.